APEX is a company that provides loans to individuals & businesses secured by commercial real estate. 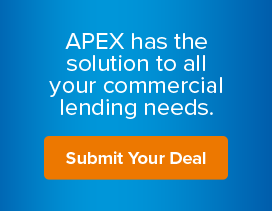 APEX works with brokers to provide direct lending to your commercial clients with urgent financing needs. Many of the businesses that we work with have found that traditional banks will not underwrite small balance loans or loans to support building purchase, renovations, debt consolidation or some other commercial mortgage application. Many self-employed building owners find that banks just don’t understand them, but APEX does! Please click here to learn more about our credit rating program. It is very simple to find out how APEX can help you – call us at (877) 604-5304 or submit your deal and a mortgage specialist will contact you. Get more useful information and tips about closing small balance commercial mortgages on our blog.